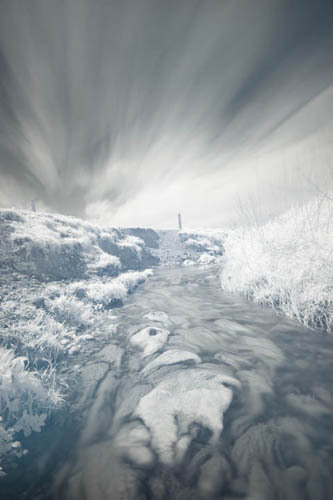 Recently I've been looking more at doing long exposure infrared landscape photography. For me, this means an exposure of approximately 3 minutes - just enough for clouds to blur into nice streaks on a windy day. 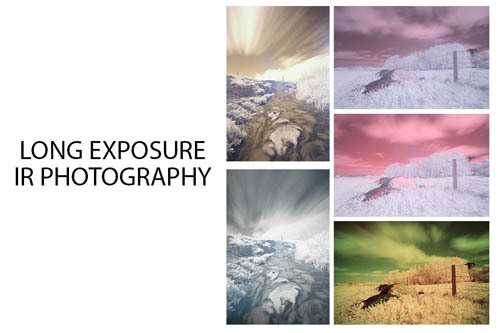 While you might think infrared long exposures would be relatively simple, there are a lot more factors to consider than in standard visible light long exposures. 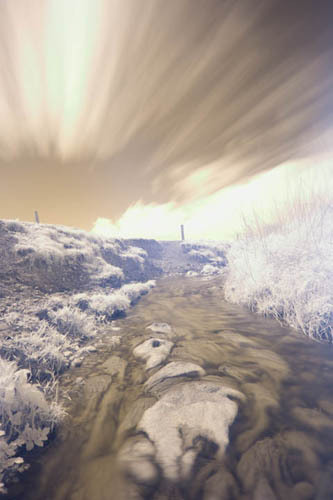 So far I've experimented with both pure infrared long exposures, and infrared mixed with visible light long exposures. I'll share my findings so far and some of the issues in this post. I looked at using an unconverted camera for infrared photography previously, and how this necessitated using a long exposure. 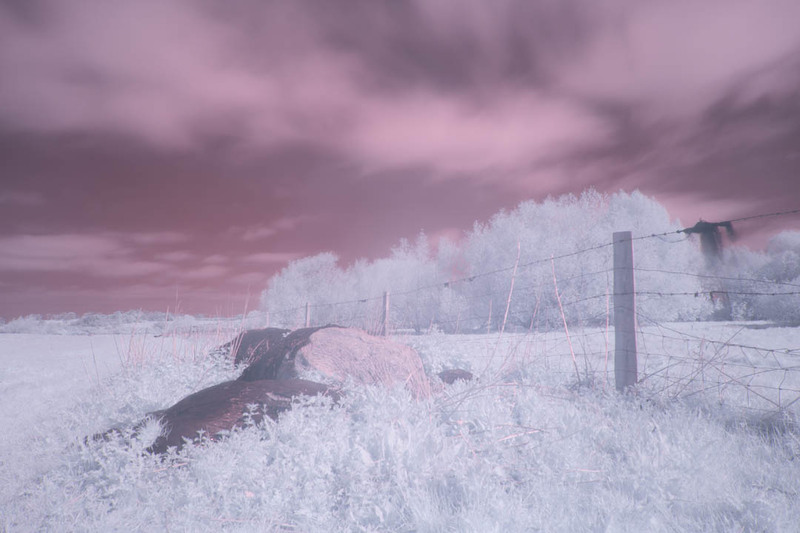 One of the problems I noted there was that the infrared filters I am using (Zomei branded) leak a very small amount of visible light, and this becomes accentuated when using an unconverted camera for long exposure IR. 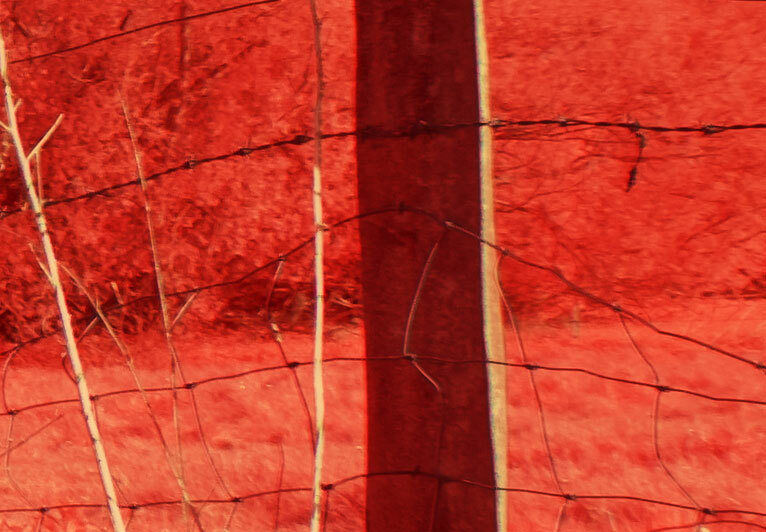 While having a bit of colour in your photo from visible light is not necessarily a bad thing, it was causing issues with the lens I am mainly using for this work. The visible light and infrared light were being focused at different points, causing a very bad chromatic aberration effect. Since writing that article I had the idea of adding a plastic neutral density filter in front of the IR filter. Plastic ND filters only cut down on visible light. So in theory this should be able to compensate the unconverted camera's extra sensitivity to visible light. Lee 730nm filter - 210s exposure. Although this filter gives a good pure IR image for comparison, long exposures taken with this filter seem to be very soft and I don't know why. As you can see, while the plastic ND0.6 (2 stops) filter did not completely cut all visible light, it is quite a marked improvement over just the IR filter on its own. Part of the problem with normal long exposure photography is that you need a very strong neutral density filter to be able to get a long exposure in daylight. 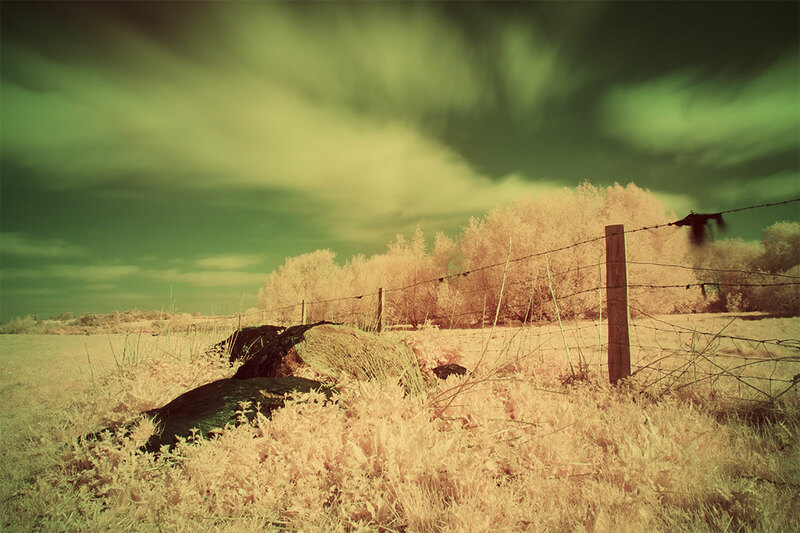 The same is true for infrared long exposure photography. It turns out that there are now quite a few different cheap ND filters available. I purchased a Zomei Slim Pro II ND3 filter for around £25 from eBay. Much cheaper than the £100 for a Lee Big Stopper. On testing the filter I found that it cut around 10.5 stops of visible light, but only around 7 1/3 stops of infrared light, i.e. it had an IR leak. Seven and a third stops was definitely not enough for a long exposure in daylight. So I then purchased an XCSource branded 'Ultra Slim' (it's actually standard filter width, not slim) ND3 filter for £10 from Amazon. It had good reviews, so this seemed like an absolute bargain. However, the XCSource filter was similar to the Zomei. 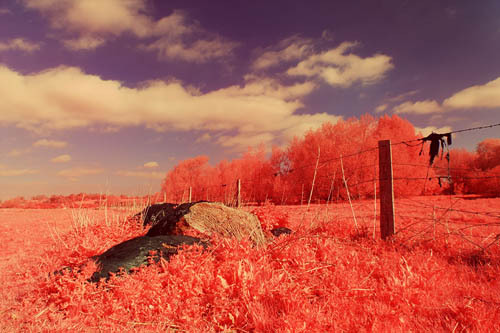 It reduced exposure by around 10 stops in visible light, but only around 8 stops in infrared. Using both filters together gives a 15 1/3 stop reduction in infrared light, which is certainly enough for a long exposure. However, it's a bit longer than I would like. 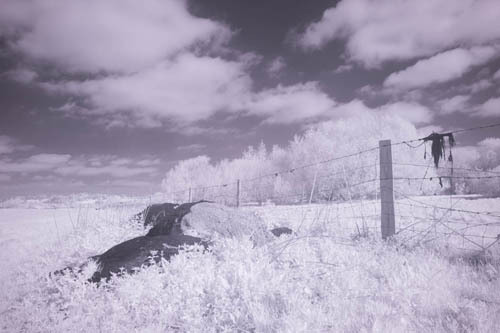 By my calculations, a 13 2/3 stop exposure reduction is needed in bright sunlight to give a 3 minute IR exposure. In bright sunlight on a windy day, 3 minutes is enough to capture some nice streaky clouds, but not so much that the streaks and sky blend into each other too much. Obviously, this is down to personal preference really. As you can see above, using glass ND filters with the Zomei IR filter on a converted camera gives a much purer IR result (no colours) than using the same Zomei IR filter on an unconverted camera with no additional filters. I am now awaiting a 6 stop ND filter, which I hope when combined with one of the 10 stop filters, will give me the kind of exposure times I am looking for. 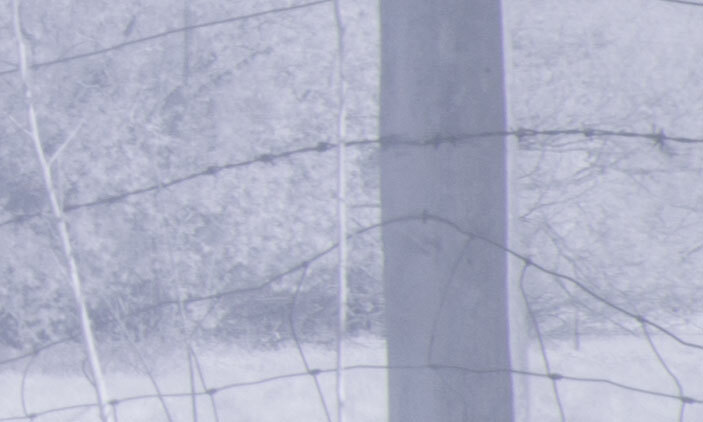 If I'm correct, that combination should work well for both IR and Visible light long exposures. 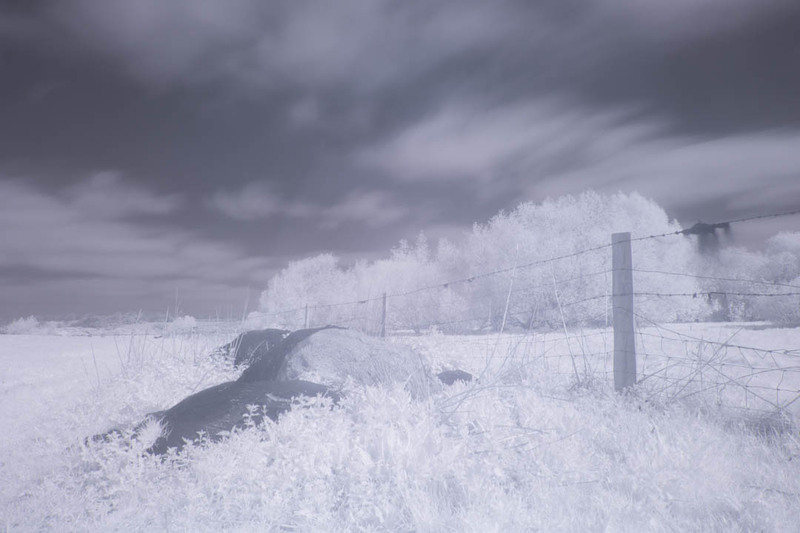 I figured that while the two 10 stop ND filters combined were a little stronger than I wanted for long exposure infrared photography, they might be the correct strength for a long exposure that combined both infrared and visible light. 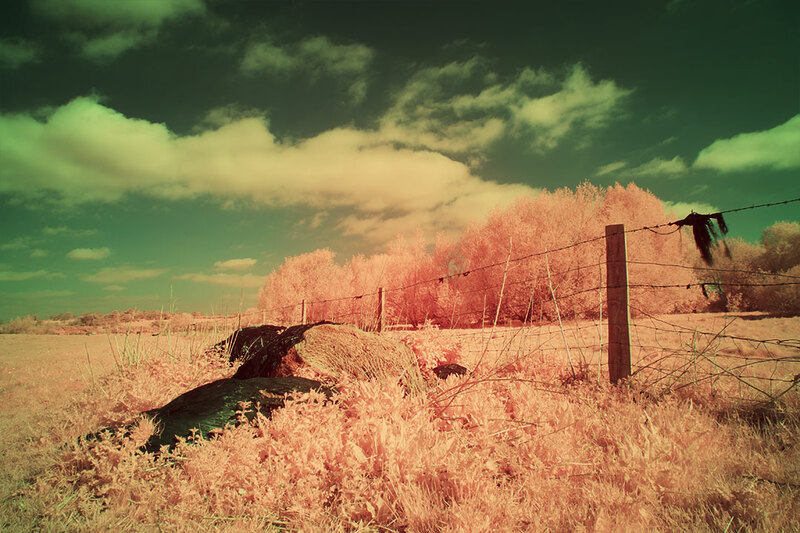 I decided to test this by taking a Kodak EIR / Aerochrome style photo, which involves using a yellow filter to capture an image made from Green, Red, and Infrared light (no Blue). 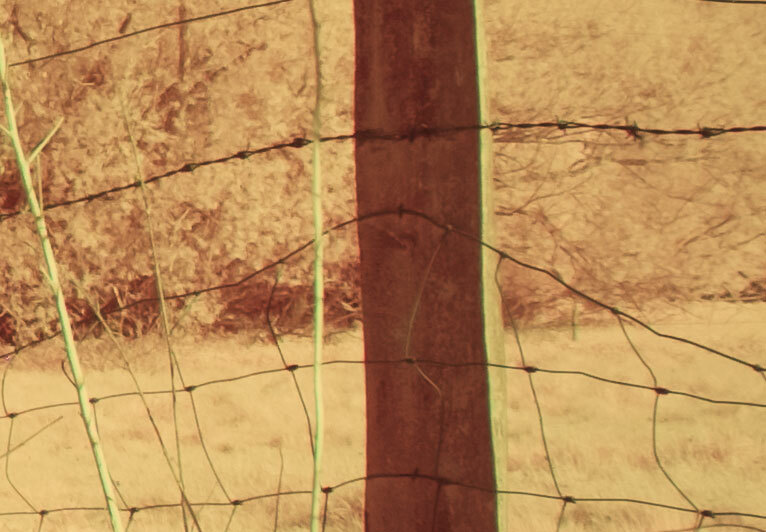 For the comparison below, the yellow filter only image was run through CornerFix to remove vignetting and the IR hotspot. The other two images weren't because I haven't created CornerFix profiles for those filter combinations. The images had their white balance set separately on the clouds. Then the same curves and channels adjustment were applied to all three images. As you can see, when we add a ten stop ND filter the balance between visible light and infrared light is shifted much more to the infrared. 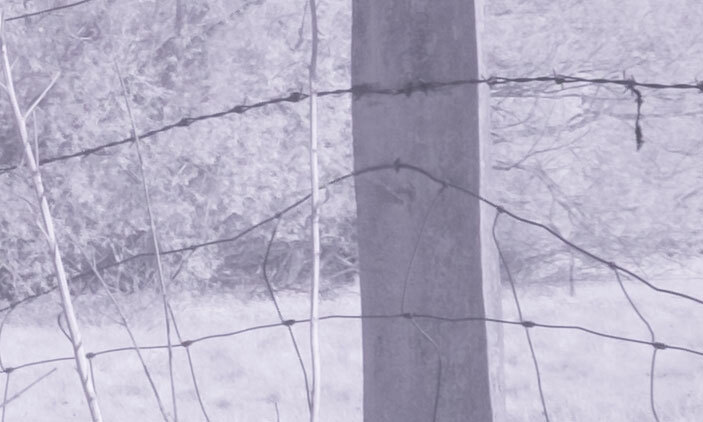 The image is noticeably less colourful than just the yellow filter by itself. 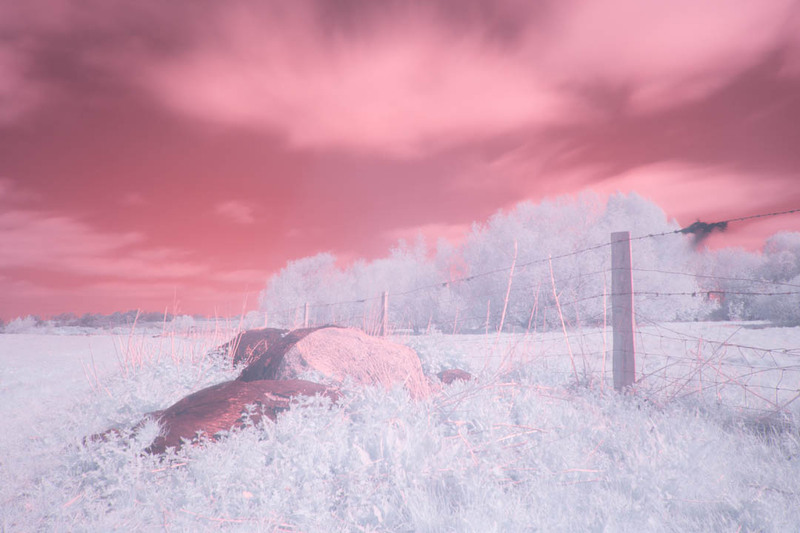 In hindsight, this should not be surprising, since the ND filter passes more IR light than it does visible light. (Or should that be blocks more visible light than it does infrared?) And so infrared makes a greater contribution to the image when the ND filter is added. When we add the second 10 stop filter, this is just accentuated even more. Our image still has some colour, but it is now much more an infrared image than a more equal mix of infrared and visible light. Note that on the day I took these images it wasn't particularly windy, so the clouds haven't streaked as much as I would like. 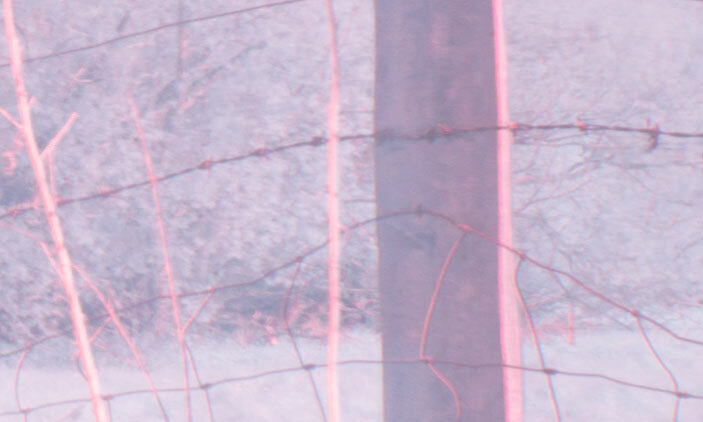 To sum up, using glass ND filters on a converted camera, or plastic NDs on an unconverted camera both seem like decent ways of capturing long exposure IR images. 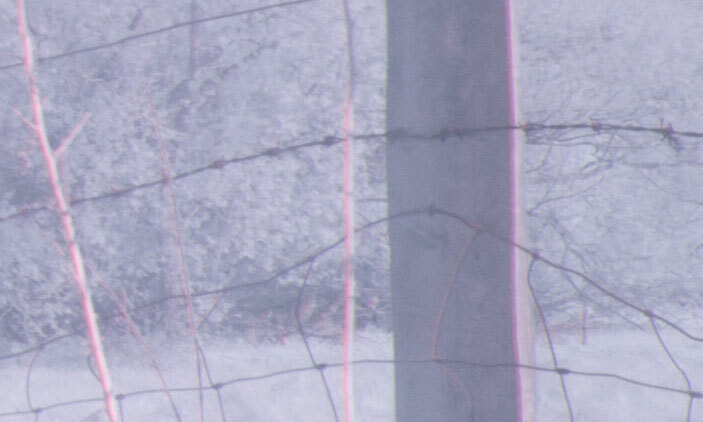 Capturing long exposure images that are a mix of both IR and visible light seems very tricky, and I am not sure of a good solution for this. When I get my ND1.8 filter, I will hopefully do a comparison with that filter and my two ND3 filters in terms of colour cast and image degradation for visible light photography. Very useful, thanks! I’m just starting with using IR filters on an unconverted camera, and wondered how to do long exposures if I got my camera converted. I had no idea that standard ND filters actually do cut an appreciable amount of IR from the exposure. I have plenty of 10 stop and 6 stop options, so I’ll give it a go! Great article! I have a converted CanonT5 830nm and I always missed the correct timing for long exposure infrared. Now I understand why :-). Thanks!